I have just upgrade from 7mbps to 12mbps. on the 12mbps what should I get when i do a speed test. I get around 10.37mbps download speed and upload speed is 0.83mbps is that close enough to 12mbps or is something a little better then that. I know I won't get the full 12mbps but is 10.37mbps close enough. 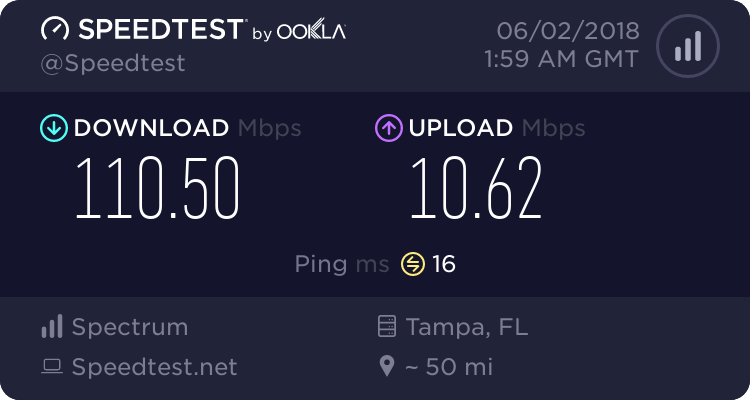 to which I should see in a test I use the speedtest.net site. Thanks. I also got build in wi-fi in the dsl modem and a build in firewall as well. I also put the modem and the router in to sheath mode and i went to www.grc.com and do a ShieldsUP test and all ports are in sheath mode so the dsl modem router. and the firmware is up to date. here is my DSL speed test is I know I should get something faster but all I can get righ now is DSL at 12MBps and I am getting 10.39 to 10.43mbps. i just want to know is that close enough it should it be closer to 11mpbs or a little higher. That's close enough, it may be higher or lower at different times or under different conditions. Scott. that what i was thinking to. and it is fast enough for what i need it for. I don't upload or download huge files. and by the way scott I am using the dsl 12mbps on the old T420 lenovo thinkpad. I am not sure what the Ethernet speed is. see the test i did one from speedtest and one from centurylink. I don't know why i am getting higher speed now then i did before. it has a built in wireless router too and i am using that on a roku stick cut the cable cord works great really fast for streaming tv and movies to my tv set. so what are you thoughts about the speeds from this post to the older post i posted on here. You quoted my thoughts in your post above. Scott.